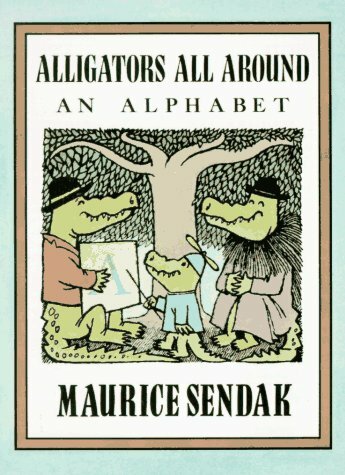 “Alligators all around” by Maurice Sendak is a book that will make you smile and make you feel so good about the world around you. It is a book that makes you see things differently. The book is an alphabet book but all about alligators and their day-to-day life. It is most charming and you cannot help but swoon over the family of alligators and their quirks. “Alligators all around” is an alphabet book that teaches a lot. It is all about what alligators do and they are adorable if I might say so. The illustrations are absolutely gorgeously done and have the humour intact about them. Sendak presents the alphabet most differently and in a unique manner. I absolutely loved it. You can read it in 10 minutes but it is not about reading it, as much as it is about paying attention to the illustrations. Maurice Sendak is a well-known children’s writer but I don’t think he wrote for children. Maybe this one, but not the others for sure. I think there was something else at play, which was targeted at adults than children. All said and done, “Alligators all around” will appeal to both children and adults and is a book to keep. This entry was posted in Authors, Authors I Love, Books, Harper Collins, Maurice Sendak, Review and tagged Alligators all around, Alphabet Book, Children's Books, harper collins, Maurice Sendak, Picture Books on February 19, 2015 by thehungryreader.